as I see it: Too Hot Too Cool ! Too Hot Too Cool ! As many of you, I have also been spending most of my time watching IPL - 2. After the Royals' onslaught on Kings XI Punjab this Tuesday, the next match was between Kolkatta Knight Riders and Delhi Daredevils. KKR hasn't had a good season, in fact they have had a horrible season. They are at the bottom of the table with only ONE victory in their kitty. I wonder how did that happen, I pity the losing side. So, seeing the match and the horrible performance by the Knights I spent a few minutes thinking about what is wrong with this team. Nothing, absolutely nothing went right for them. Again that sounds much better than what it actually is, i.e. EVERYTHING is going WRONG for them. The skipper McCullum lead from the front by dropping a not so difficult and important catch of DD's skipper Gambhir. The team simply followed their captain and put in their best in dropping most of the catches, misfielding and giving as many boundaries as they could. On one occasion when I thought that Gambhir had nicked it and it was a clean catch, this time it was the umpire who refused to raise his finger and adjudge Gambhir out. Not only this, every few deliveries you could hear the commentator say something like "Edged and four", "Edged, over the keeper's head", "Edged, past first slip for four", "Edged and that would beat the third man". It was all going wrong for the Knightriders. They were taking a beating from LUCK itself and the fielders were anyways not helping themself out of the mess they were in. Taking a look at their team, I think they have a pretty decent team on paper. But they have not preformed to their potential. The dangerous McCullum ripped of the opposition attack only in ONE innings and that was in match number ONE in IPL season ONE. Another explosive batsman, Ricky Ponting had just failed to perform last year. Chris Gayle, the most violent of all when it comes to thrashing the bowlers, was injured in the last season and has failed to do anything significant this season as well. KKR's bowling attack got a blow when Pakistan players had to keep away from the IPL. What they had was Ajantha Mendis who I personally don't admire as much and think is an overhyped player. You can bowl the 'Carrom Ball' and trick batsmen once or twice or even thrice, thats it. There is nothing extraordinary in that bowling other than that. Poor batting, bowling and fielding has ensured that they don't win any match. They are on a losing spree! I am doubtful if team owner SRK (who came back to India and said that he won't return until his team starts winning again) will get a chance to come back to SA from India if they continue like this, which I think is very likely. And that isn't all. The tiff between coach Buchanan and Ganguly, the multiple captain theory and the captaincy being taken away from Ganguly and handed over to McCullum, all shows the atmosphere within the team management and the players. Add to it the sacking of players like Aakash Chopra and Sanjay Bangar, what has just happened to this team? And as if this was not enough, that problem took another avtar, this time in form of the FakeIPLPlayer (a blogger who claims to be a member of the KKR Squad and keeps on giving updates about the team's strategies, differences, tensions amongst players and management and many other happenings in and around the team). They are going through a really bad phase. It is difficult to say which was worse, Bangalore Royal Challenger's condition last year or KKR this year. PS : Just saw a report on NDTV, saying that Buchanan and his team will no longer be with the KKR Team in the next season of IPL. They went on to the people of Kolkatta for their reaction on this news. Boy, they were really excited and celebrating it. One guy said that he is very happy and he riduculed Buchanan top to bottom and even blamed him for bringing all Aussies into the team and destroying the KKR team while keeping the best Bangladeshi bowler Mortaza (who KKR won in the auction after a hard-fought battle with Punjab). 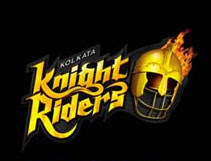 Strange enough but the reporter said that SRK and Co. have deliberately removed 'Kolkatta' from their team's name and that it is now referred to as 'Knight Riders' only. Now I didn't know that.